Disc golf is a sport on the rise in both America and worldwide. Disc golf is played much like regular golf, but with specially designed flying discs instead of a ball, and an elevated basket as the ultimate target. Here in Milwaukee the game is played primarily on the designed course at Dreztka Park on Bradley Road and at Valley View Park in New Berlin. But there are some disc golf fanatics in Riverwest who wish to someday have a course right here in the neighborhood. “We created this practice course in Gordon Park because one of our courses (Dreztka Park) gets closed in the spring and we have nowhere to play, but the other part was that the travel time and the distance to play a course in the Milwaukee area is pretty far,” said David O’Keefe. O’Keefe, along with Monroy Gowens, Marshall Glassford, and Kurt Raffensperger are four among many Riverwest residents who enjoy the sport of disc golf. O’Keefe and Gowens saw the opportunity for Gordon Park to become more than just an area where local folks bring their pets or practice soccer. 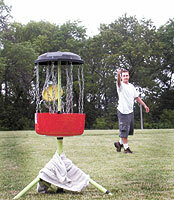 They saw it as a potential practice course for disc golfers in the area. “It’s perfect! We all live right in the area and it’s right in the city,” says Monroy Gowens. He believes that the city of Milwaukee isn’t interested in developing a disc golf course here because “their land is worth so much money and they don’t see any revenue coming from disc golf to make it worth while to them.” The four players would like to see a course directly in the city of Milwaukee, but for now the Gordon Park nine, which is what the gang calls its set-up at Gordon Park, will have to do.